I am not a crafty person. Not to be mistaken with creative, I’ve got creativity in spades. But when it comes to making that really cute stuff I see on Pinterest (My Crafty Board is Here), there is a major disconnect between how I see it in my mind and what my hands are actually capable of doing. I have tried many a things, but more often than not I have found myself on the #Fail side of Pinterest than the successful side. 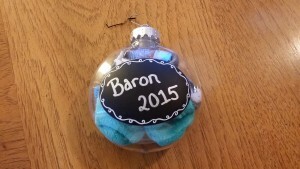 But having a newborn will convince you that, when it comes to being crafty, you need to give it the old college try. So here are two Christmas Crafts that I found on Pinterest that I figured were worth a try and the ensuing result. The Project: It is so simple – the baby cap and hospital ID band inside of a clear ornament. It’s simple, cute, and keeps the memory secure for those of us that haven’t given into the madness that is scrapbooking. Before I even started this one, I managed to #Fail, but it’s not entirely my fault. The Hospital that my son Baron was born at didn’t give him a newborn hat. They just didn’t. He was born prematurely and spent most of his time in the neonatal intensive care unit (NICU) in a temperature controlled incubator. It wasn’t necessary for him to have one of the little hats because he was warm all the time. So…there’s an entire third of my equation for this project that’s just non-existent. The second part is ENTIRELY my fault. 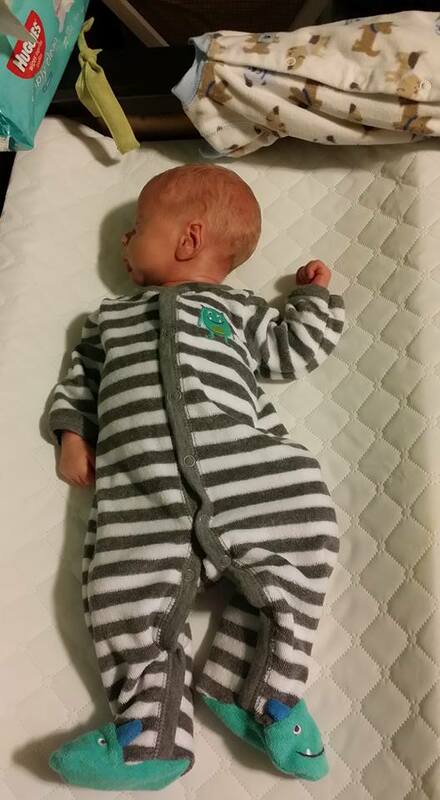 When Baron was released from the NICU I was asked if I wanted to keep his ID band. I’m fairly certain my response was (verbatim): “PSSH, what would I want that for?” Again, I am a creative person…not crafty. I don’t necessarily see things and think, “Ooh! I could make something neat with that.” Don’t worry when my folks came out for Thanksgiving, my mother gave me a tongue lashing for not keeping it and laid on the guilt. 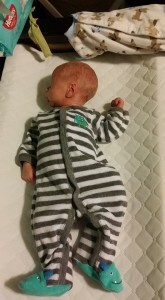 While I did not have either of these items…I did possess the onesie that Baron came home from the hospital in, pictured below. He used to be so small…he’s probably tripled in size since we took this photo! Even though he’s swimming in it in that picture, he grew out of it pretty darn quickly. So with this in my possession, I hatched a plan. Instead of doing the hat and the ID band, I was going to take parts of his onesie and put those in an ornament (in particular, the little monster faced footies and the monster embroidery from the left chest). 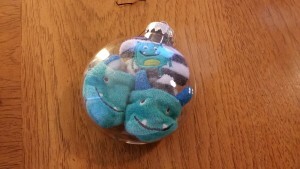 So I carefully cut the footies off and cut out the little monster and prepped them for ornament stuffing. In what I like to call the Age of Pinterest, that we’re living in, you can find clear plastic ornament just about anywhere. The one I selected was on sale at Michael’s for $1.99 on Black Friday and I liked it because it has a spot for you to write on, which I wrote Baron’s name and the year. I also liked the size of it and that it was flatter and not just a large ball. So with all my components, I started stuffing and arranging. This part takes the most patience because, inevitably, what you’re stuffing either doesn’t want to fit or do what you want it to. PRO TIP: To make your life easier, use an old school wooden pencil with a rubber eraser. The eraser will give you a little bit more grip and make it easier to arrange the items in the ornament. Sharpie Paint Pens are pretty amazing…I highly recommend them! 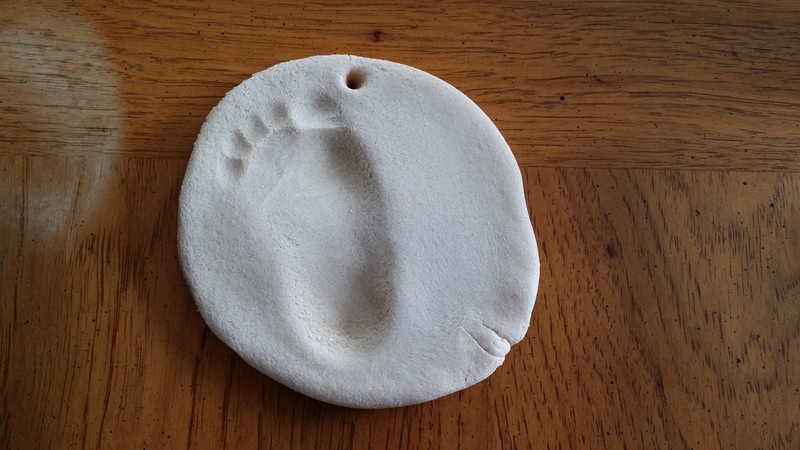 The Project: Using simple ingredients that are just sitting around the house, make an adorable keepsake for the grandparents featuring a handprint/footprint/whatever print you desire. WARNING: None of the websites (at least the ones I looked at) tell you how sticky this dough is. Let me tell you it is clingier than polyester pants that you just pulled from a dryer that you forgot to put a dryer sheet in. I’m still chipping salt dough off creases on my hands and I made these a few days ago. PRO TIP: Mixing with a whisk does not work. Spatulas work ok, but to really mix it well you’re going to have to get in there with your hands. BEFORE you do that…coat your hands with flour or cooking spray. The stuff is still going to stick to you but it won’t be as bad. When you are making the dough, you first want to make sure that you mix your dry ingredients well before adding the water. I did this all in a large bowl and got down and dirty with my hands. As your mixing to get it to a bit firmer consistency, I’d add a dash of flour. Once you have the ingredients mixed well you’ll knead the dough for about 15-20 minutes until all the lumps are worked out. If you’re doing this project with an older child, this would be an excellent point to get them involved because it’s messy and fun. 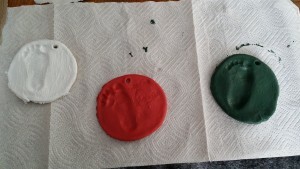 Once your dough is kneaded and of an even consistency, now it is time to roll it out to an even thickness (I went with about ½ inch) and cut out the shape of your ornaments. You can use any size/shape cookie cutter that you want and I’m sure there are tons of adorable options out there. Once you have your ornament blanks cut, it is now time to decide what you wish to forever capture! 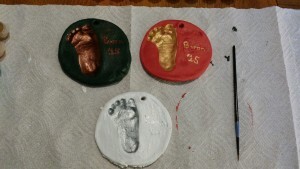 Originally my plan was to do both a footprint and a handprint on the same ornament. However, attempting to convince a 3 month old to hold their hand out flat is about as close to impossible as anything I’ve ever done. So I ultimately settled for just the footprint. My plan was also to carve his name and the year off to the side, doing this with the completely we dough is a very frustration and was the source of lots of cursing before I ultimately made the decision to wait until the ornaments were dried through and use a Sharpie paint pen on the finished product. Now to bake your creations! Finally, it’s time to decorate. I recommend using an acrylic paint as opposed to something waterbased for a couple of reasons, the biggest one being: putting anything waterbased on or near this thing will turn it into a sloppy mess again, and ain’t nobody want that. 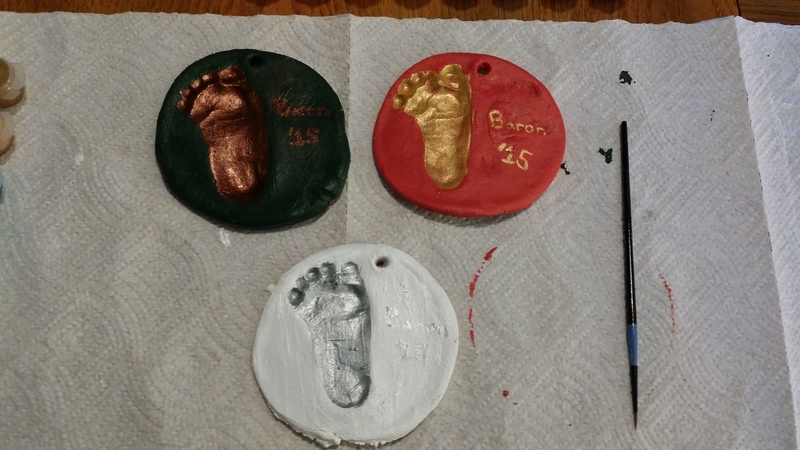 The second reason being: I think acrylic paints are just a little bit more vibrant and appropriate for Christmas Ornaments. The colors I decided on were Green/Copper and Red/Gold and White/Silver. I applied a liberal base coat of my primary color and allowed it to dry before hitting it with a second coat (just to make sure). The finish product! Not too shabby if I do say so myself. Now the finishing touch is to add your desired hanging implement. I decided on twine because I like the rustic look. I have to say these didn’t turn out too bad for not having a crafty bone in my body. So there you have it! It’s a great idea for a homemade gift for the grandparents and a delightful mess to make with your little one. I definitely plan on doing this again once little Baron is a little bit more aware because it’s just plain fun. Just one final note on the clean up, if you get the salt dough anywhere in your kitchen that you don’t want it (faucet handles, cabinets, handles, knobs, the fridge door, etc.) get it while it’s still wet. If you don’t you’ll need a hammer and chisel to get it off of there.